Sacramento, CA - Saturday evening found approximately two dozen parishioners in attendance for Vespers. The highlight of the evening was the Blessing of the Five Loaves of Bread by our beloved Bishop Maxim. As the prayers of Thanks and Praise were intoned, a quiet hush overcame all in attendance. As Vladika anointed each person with holy oil and gave them a piece of the blessed bread, each person present gathered by the North door in silent acknowledgment that we had been touched by the Holy Spirit during the service. Each person seemed to find it difficult to leave Church! We all silently acknowledged that we were in a place of utter inner peace. After the last person venerated the cross and received the bread, both Fr. Dane Popovic and Fr. William Weir began hearing Confessions. It was now time to prepare our inner selves for Divine Liturgy for the next day. Our Church Slava, Uspenije Presvete Bogorodice (Dormition of the Blessed Virgin Mary) was a glorious celebration. The day dawned bright and sunny and quickly became a perfect California day. The first Blessing of the Day was received by a number of our ‘youngest’ members. Our Kuma of the Day, Marie Milovanovich hovered over a small group of young girls: Alexandra FitzPatrick, Anna Rudko, Addison Baker, Sisters,Kristina and Brankica Mojsich, and Sisters, Teodora and Maria Popovich. Each was clutching a beautiful blooming gladioli flower or a small bouquet, expectantly awaiting the arrival of Bishop Maxim. It was wonderful to see their faces wreathed in smiles as they handed their gifts of welcome to Vladika as well as to observe his radiance when he accepted their gifts of love and welcome. Our own Fr. Dane Popovic, Fr. William Weir, Hierodeacon Panteleimon and ReaderDanny Stojanovich (visiting from St. Sava in Jackson) greeted Bishop Maxim as he approached the doors to our Church. They were surrounded by a large number of Alter Servers who quietly held candles or banners. The Alter Servers of the day were: Brothers,Savo, Jovan, and Gojko Gojkovich, Cousins, Aleksandar and Marco Tica, Nicholas Theodorovic and Marko Churchin. These young Alter Servers are often seen in attendance assisting the Clergy and adding to the majesty of our Divine Liturgy. The glorious blue colored robes caught the rays of the sun and added to the glory of the day. As Vladika entered Church, he witnessed a gloriously decorated interior. Our ownLuba Karnaookh had used pink and white gladioli flowers and olive branches with beautiful baby blue bows and ribbons on the pews. Roy Ratkovich, President of St. Sava’s Church in Jackson, CA, had once again offered branches from his olive trees to us for our Slava . Lovely gladioli bouquets stood before each of the icons on the Iconastasis. As Vladika entered the Nave of our Church, he witnessed bowed heads everywhere as each of us awaited his first Blessing of the day. Protinica Milica Popovic led the Choir as “Ispolajeti Despota” was sung in welcome for our Vladika. In the Sanctuary, Protopresbyter Miladin Garic, our much loved retired Priest, patiently waited for the Clergy to join him. Even though he did not serve, his presence was welcomed and felt by all of us in Church. It is primarily thanks to his efforts that we have such a magnificent Church in which to pray. We Thank God for Proto Miladin and his continuing presence in our lives. 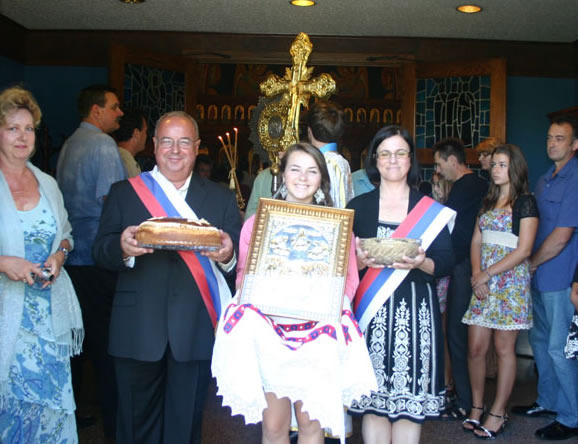 Our Kumovi for the Day, President Miroslav Milovanovich and Marie were joined by granddaughter, Addison Baker, as they stood in the front row before the Memorial Table for the Divine Liturgy. The prayers that were raised and the atmosphere of reverence and gratitude to God for all He has bestowed upon our parish was shared by all of us. Many had gone to Holy Confession in preparation for this day. Led by Kum Miroslav and Kuma Marie, the long line of people who received Holy Communion was witness to the fact that we have become a reverent community in the Body of Christ. We are extremely grateful to our blessed Bishop Maxim for his presence in our midst for this special day in the life of our Church. His spiritual contribution to our celebration in honor of the Holy Assumption of the Blessed Virgin Mary elevated our collective prayers to the Throne of Christ. His brief Sermon exhorted all of us to remember the special significance of this festal occasion and the theological significance of the Blessed Virgin in our lives. He spoke about the great honor paid to Presvetoj Bogorodici as Mother that when she left her earthly life, her Son, Jesus Christ, was on hand to immediately receive her soul in Heaven. He reminded us that not only Serbian people, but Greeks, Russians, Palestinians – in other words, the whole Orthodox world – all honor this holy day and remember the day with utmost reverence and importance. As everyone gathered in our Serbian Cultural Center, smiles and laughter were shared by everyone. Vladika was surrounded by our Clergy and children as he began the brief service of thanks and the blessing of the Slavki Kolach and Zhito. Zorka Stijakovic had made both the Kolach and Zhito and all agreed her talent was obvious. Protinica Milica (surrounded by a small Choir group) sang the Hymn of the Day. Immediately following the Hymn was a brief program offered by our children. Short prayers to the Blessed Virgin Mary were read or recited by several of the children. This was followed by several Serbian dances performed by our young children and teen agers. Our President Miroslav made the food for our delicious Banquet. On the menu all were offered either turkey or pork! What a treat for our palates. He thanked Zorka Gojkovich and Dragoljub Cvjetkovic for organizing the kitchen and food servers. He thanked all for coming to share in the prayers and activities of the day. He encouraged all of us to enjoy each other’s fellowship for the afternoon. In addition to our Bishop Maxim as our honored guest for the day, we also had in our midst the President of our Diocesan Council, Ron Radokovich. Ron introduced us to a new fundraiser that Our Diocese is spearheading to assist in the restoration of the Monastery Hilandar which is located on Holy Mt. Athos in Greece. The Circle of 100 is to encompass 100 Stewards of our Serbian Orthodox Church in our Western America Diocese who will commit to donating $ 1,000 each for the next three years. This amount of $ 100,000 per year for the next 3 years will allow the work to again continue on the rebuilding of Hilandar that was destroyed by fire several years ago. God allowed the hearts of 9 of our faithful to open to this worthy endeavor. Our total offer will be $ 27,000 from these 9 individual families. Our Church community was honored to be the first Church community to be told of this program in the Western Diocese. How good to know that the work of God on Mt. Athos will be assisted by us in faraway Fair Oaks, CA. A special “Thank you!” is extended to all of those who contributed to making this a highly successful and rewarding day in our individual lives and in the life of our Church. A Special Thank You is extended to Bishop Maxim for Blessing us with his presence and prayers. May God continue to Bless Us and may we be found worthy of receiving His Blessings.